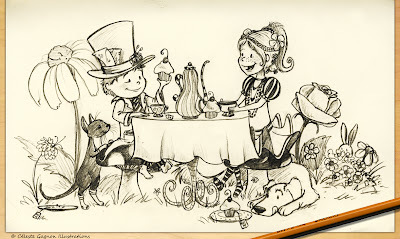 This week the kids were watching Alice in Wonderland, they like the real life Tim Burton version, so I was doodling while they watched the movie. It's one of my favorites too, both the Disney Cartoon version and the Tim Burton one, just so much imagination in the world they create! I think this doodle might have to become clean art at some point, I quite like it! Feel free to click the above image for a larger view! To see previous sketchbook Friday's click here!